MANILA, Philippines – The strong typhoon with the international name “Maria” has maintained its strength as it moves Northwestward, state weather bureau PAGASA announced in its 11:00 a.m. update on Sunday, July 8, 2018. The eye of Typhoon Maria was located based on all available data at 1,820 km East of Northern Luzon (outside the Philippine Area of Responsibility or PAR), 19.0°N, 138.9°E. 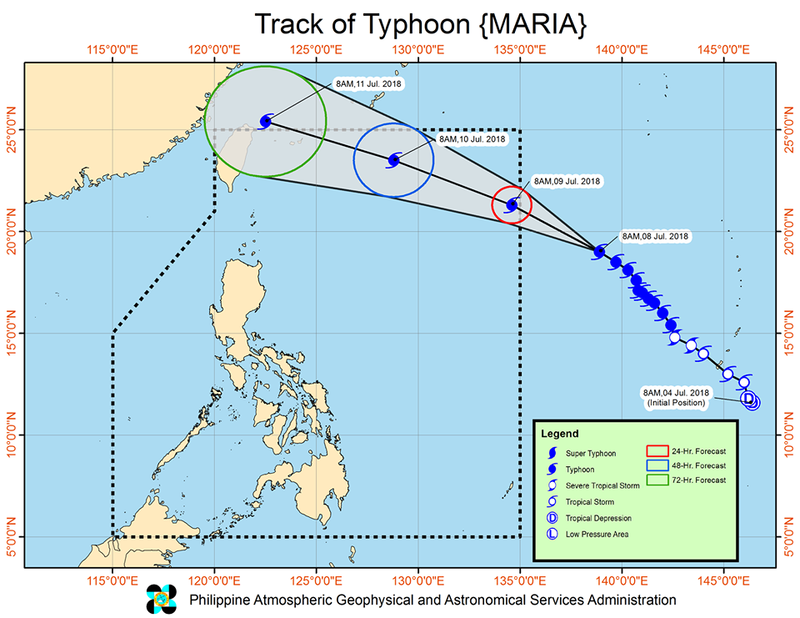 'Maria' has maximum sustained winds of 185 km/h near the center and gustiness of up to 225 km/h. It is moving Northwest at 15 km/h. PAGASA said Typhoon Maria may enter PAR on Monday morning July 9. It will have the local name "Gardo." PAGASA said Typhoon Maria is possible to reach the super typhoon category while it's outside PAR. PAGASA warned that while landfall of Maria in the Philippines is less likely, it may enhance the southwest monsoon (Habagat), which will bring heavy rains over MIMAROPA and Panay Island until Tuesday (July 10). Occasional rains is also expected over Metro Manila, the rest of Western Visayas, and western sections of CALABARZON and Central Luzon due to enhanced Habagat. Residents of the aforementioned areas, especially those living in low-lying and in mountainous areas, are advised to take appropriate measures against possible flooding and landslides due to heavy rains, coordinate with local disaster risk reduction and management offices, and continue monitoring for updates. Meanwhile, Accuweather reported that 'super typhoon' Maria is expected to threaten lives and property when it barrels across Japan’s Ryukyu Islands, Taiwan and eastern China on Tuesday through Thursday.